Please choose a login and password that you will remember. Once you have registered you will need to activate your registration by clicking on the link in the email which will be sent to the email address you entered during registration. You can view the number of credits you will need for each type of MOI on the Products page. 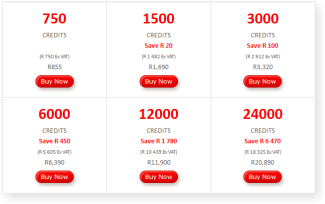 One credit = roughly one Rand, depending on how many credits you purchase. (Volume discounts apply.) Click on the Purchase option in the toolbar at the top of the page. Then select the number of credits you would like to purchase and click on the Buy Now button. Once you have registered you can begin creating new MOIs. You'll notice that after you log in there are more options in the thin black bar at the top of the screen. Click on New MOI to begin a new MOI. Or click on Extras to view the blank Pre-MOI questionnaires or other information of interest. © 2019 Memorandum of Incorporation. All Rights Reserved.